All The King’s Men was written by an incredibly talented and diverse team of writers from around the world. The stories in the anthology are informed by their unique perspective on the world, and their own fascinating experiences. 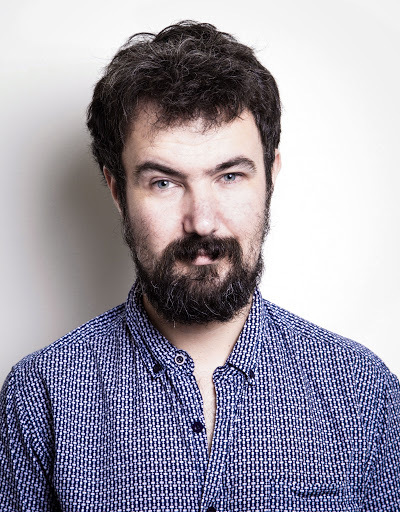 Today’s featured writer is Emmet O’Cuana, a writer, editor and critic based in Melbourne. As I type this I am furiously submitting CVs to new prospective employers as I have just quit my dayjob. Freelancing is rewarding and I particularly enjoy editing material for other writers – but it’s nice to have a bit of cashola coming in on the regular. I emigrated to Australia permanently in 2010 after spending a half-decade or so as a government bureaucrat and it turns out that is a hard habit to break. But this country gave me the opportunity to engage with creative communities like Australian comics, so now I get to dream up weird stories while continuing my desk-jockey status. I have worn many writer hats since I (disappointingly) sensibly entered the Irish service after college. I have drafted policy documents, written about taxation legislation, advancements in radiation oncology – oh and stories about steampunk vampires, zombies, Martians and black magick witches. It’s all much of a muchness in the end. You develop your premise, identify themes and plot the execution. Sometimes you end up with a story about a Taiwanese priest fighting the undead in Sydney. Sometimes you write a summary of European tax legislation. 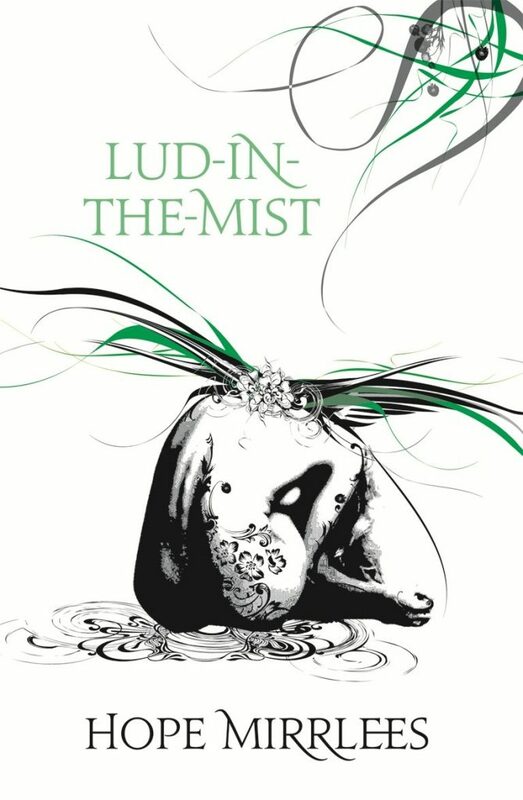 One of my favourite books is Lud-in-the-Mist (1926) by Hope Mirrlees. It is a beautiful piece of delicate writing, with a hidden bite. What I admire most about it is the sense of commitment to the story’s theme of the power of imagination and the dangers in trying to repress the urge to make-believe. Recently I was very impressed by Peadar Ó Guilín’s The Call, which perfectly executes the YA fiction model and draws on horrifying imagery from Irish mythology. Comics-wise I’m really enjoying anything by Miss Lasko-Gross – her latest book The Sweetness is about a galactic drug smuggling operation, which is a fantastic idea. I am also currently obsessed with The Electric Sublime by W. Maxwell Prince, artist Martín Morazzo and colorist Mat Lopes. I had an English teacher once – hope you’re doing well Mr Kelly – who introduced me to mind-mapping as a way of critiquing a book. Good thing he did too – the book in question was Silas Marner, which with the best will in the world, is not a terribly exciting novel. I have continued to use the same method to develop a story idea, often by first asking the artist is there something in particular they are interested in working on. It allows me to work out the various associations and ideas I can draw on to flesh out a basic idea. I then use that map to sketch out an overview and thumbnail the pages. These are not for public consumption though Shane. I have *zero* illustrative talent. I prefer to work full script after my thumbnailing is complete, but I consider this more a conversation with the artist than a dictation. Both parties of a collaboration should have a sense of ownership and creative expression from the finished product. Your story in All The King’s Men is a short comic entitled The Human Factor, a piece that you have described as a snarky take-down of Ayn Rand. Can you unpack this a little for our readers, please? Also, can you tell us where this story came from, and what it means to you? The story itself was inspired by an early conversation between us, where I complimented you on your science fiction universe. I was reminded of Frank Herbert’s Dune series, or Alejandro Jodorowsky’s Metabarons with its warring corrupt power factions. Here was a lot of potential to explore some classic science fiction ideas I felt. And one of the most consistent threads in sci-fi is the use of allegory, from Wells to Atwood and onwards. The Human Factor is a response to Atlas Shrugged by Rand, in that here is a human society that deliberately withdraws from mankind but cannot leave well enough alone. People have to be made aware that they are absent. So in the story we learn this hidden society, called Hy-Brasil (typically on-the-nose for would-be Randians) has flooded the universe with traces of unaccounted art designed to lure explorers to their region of space. The script namedrops the Borges’s story Tlön, Uqbar, Orbis Tertius and is a darker take on the Cythians from Star Trek: The Next Generation. Rand – Borges – Star Trek: yeah that pretty much covers it! I would like to mention though that recent events point to a widespread individualization where it comes to social capital, labour – even the very concept of society – and that disturbs me greatly. I fear old Ayn might have had the last laugh after all courtesy of greedy politicians and Californian ‘disruptors’. You spent quite some time hosting the Australian comics podcast Beardy and the Geek, and got to see quite a lot of the local comics scene up close. What are your thoughts about the state of Australian comics at the moment? Those creators I met in the short time the podcast was running were so enthusiastic about their work, how could I not be bit by the bug? My co-host Ryan Huff and I wound up writing scripts shortly after the show began. I would credit that to the folks we spoke to being so generous with their thoughts on storytelling, process and the importance of producing art locally. I do not keep my ear to the ground as much as I used to, but I do think a shift has occurred, most notably given the example set by Ryan K. Lindsay. Here is someone who has a plan, executes that plan and engages publicly. The cultivation of an audience is not an accident of talent, or personality. It comes down to a solid business plan – and Australian comics understood as a business activity for sole traders is essential for that to succeed. When we were recording the show Ryan and I would frequently namecheck Nicola Scott and Tom Taylor – not just because they were producing books for DC, which is as you know considered a metric of success, having a book out from one of “the Big Two” – it was because they were public advocates for their respective careers. It is no surprise to me that Lindsay is now writing for DC too. All that said – I am very excited by the diversity of books coming from Australian creators. Sam Wallman’s Fluid Prejudice featured some excellent discussions of discrimination and protest in recent history. Joshua Santospirito is becoming a compelling folk storyteller with The Long Weekend in Alice Springs and Swallows. Tatiana Davidson – sign me up for whatever she does. 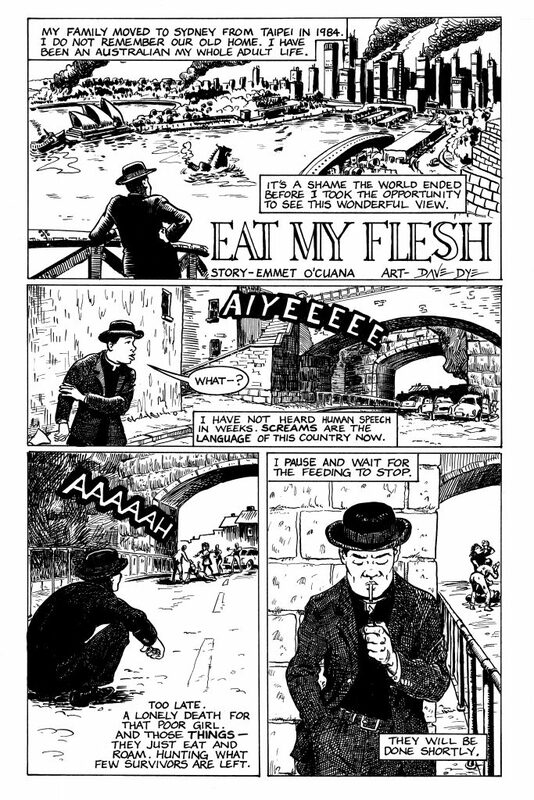 There’s been an explosion of editorial sequential comics courtesy of Eleri Harris and Sam Wallman’s work – see also Kate Moon and Ele Jenkins – and the potential for Australian comics to explore political commentary in near-simultaneity, given the troubling events unfolding right now…well I’m very grateful. You recently presented a paper at the Superhero Identities Symposium at ACMI. What can you tell us about the paper, about the experience, and about the state of comics scholarship? I reworked a book chapter I had written on James Robinson and Tony Harris’s creation Starman, with a focus on the protagonist’s choice of costuming. 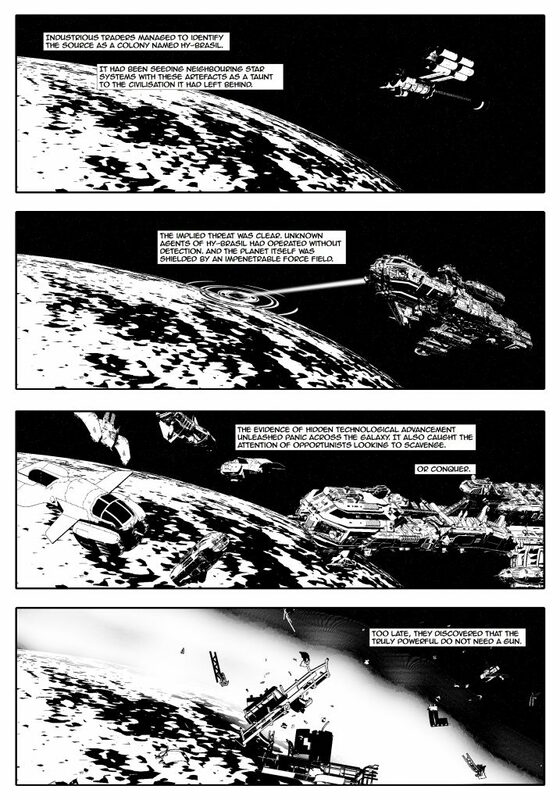 My idea was to explore how the comic uses Jack Knight as a source of criticism towards the idea of the superhero – he refuses to wear a costume because he judges the Starman duds his father wore ‘ridiculous’ – and then the story resolves that conflict between Jack and the superhero community in order to neutralise actual real-world criticism of superheroes. It all starts with mocking the look of the cape and tights brigade. To say I was nervous was something of an understatement, but overall I enjoyed the experience. I attended a number of papers given by speakers from a diversity of academic disciplines. What is intriguing to me is how comics, in particular superhero stories, are now being looked at as metaphors for the state of modern living, what Vlad Iouchkov from Western Sydney University described as the hyperreal. Some particular highlights for me were Neal Curtis’s paper on the use of Captain America as a fictional barometer for political upheaval; Amy Maynard’s discussion of Australian satire in relation to the idea of a superhero; Benjamin Saunders giving a whistle-stop tour of “lost superheroes”; and Nicola Scott on the Women in Comics Panel thoughtfully countering the criticism of Wonder Woman’s body shape vis à vis the outcry after the UN ambassadorship, a precursor to her Guardian Op-Ed. You’ve got a number of projects either recently completed or on the go at the moment, including a series of four stories with artist Dave Dye, and a story with artist Matthew Dunn, to name but a few. What can you tell us about these? Are you working on or planning anything else at the moment? Let me tell you about Dave. I sent him three scripts, while working on a fourth, with the idea being – pick one of these to keep you occupied while I finish this other one. He instead turned over all three! We have already successfully booked Meanwhile… anthology to publish one of them, a zombie story that riffs on Australian immigration (see mate? Allegory, love it). I am shopping the other two about. Matthew and I have a few coals in the fire and I have spoken about our occult detective riff before. He’s a very in-demand artist and I’m not only excited to see our collaborations take shape – you need to catch what the man himself has in store in 2017. It’ll blow you away (while also scaring the bejaysus out of you). I am also working with a Brazilian artist named Jeff Sadzinski, a very talented and professional young man who took a script I wrote about space aliens and video game violence and has just been punching through the roof with his character creation, panelling and colours. This guy is someone to keep an eye on, remember the name. Oh and I just had a short piece of prose come out from the Del Sol Review called Faith of our Fathers – an alt-history piece about religion in Ireland – and a digital magazine version of Hopscotch Friday, featuring articles by Anthony Castle, Emma Beddows, Ben Kooyman, is out soon curated by Stevie O’Cuana and myself. I’ve been flirting with the idea of throwing together an anthology one-shot. That would be a challenge. For now I have a script I’m developing based on research into post-Australian comic industry characters. I am aiming to have a mixture of contained graphic narratives and various shorts (comics and prose) out in the wild by that five year mark, and be more established as an editor by then as well. 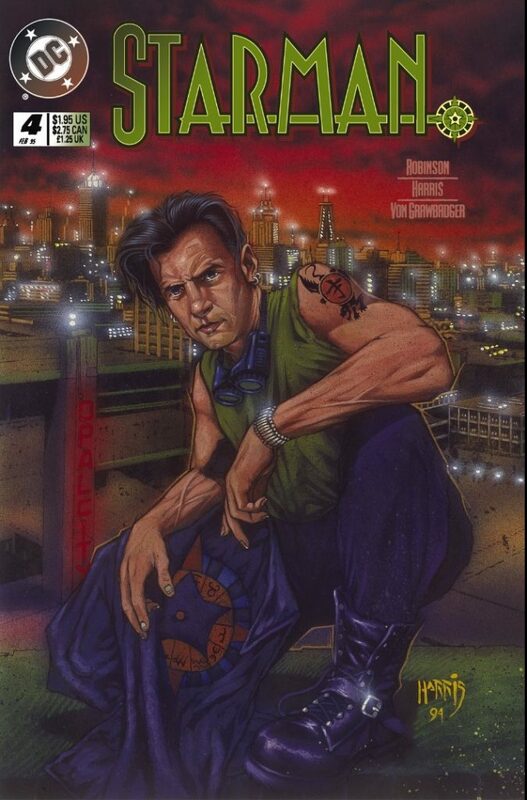 I also hope to have finished Alan Moore’s Jerusalem. We here at ATKM HQ think Emmet is a writer worth following.